When Nikon unveiled the D800 alongside the D800E it was hard to believe that behind the F-mount lay a 36.3MP sensor – the highest resolution of any DSLR at the time of its launch, and a claim that still holds truth today. With both becoming the hot topic of conversation among photographers, photo press and the trade alike, it sparked a series of questions as to whether such a high resolution was needed, how the enormous file sizes would be handled and perhaps more fundamentally, who Nikon were trying to target as their audience with these high resolution beasts. Two years on and we’re left questioning why we ever doubted the D800/D800E‘s existence. Both have won an endless list of accolades, proving to be the choice of professional and enthusiast photographers around the world who demand they capture the finest levels of detail from a scene using a camera that ticks virtually every box. I say virtually every box because two things the D800 and D800E weren’t successful at were being small and lightweight. 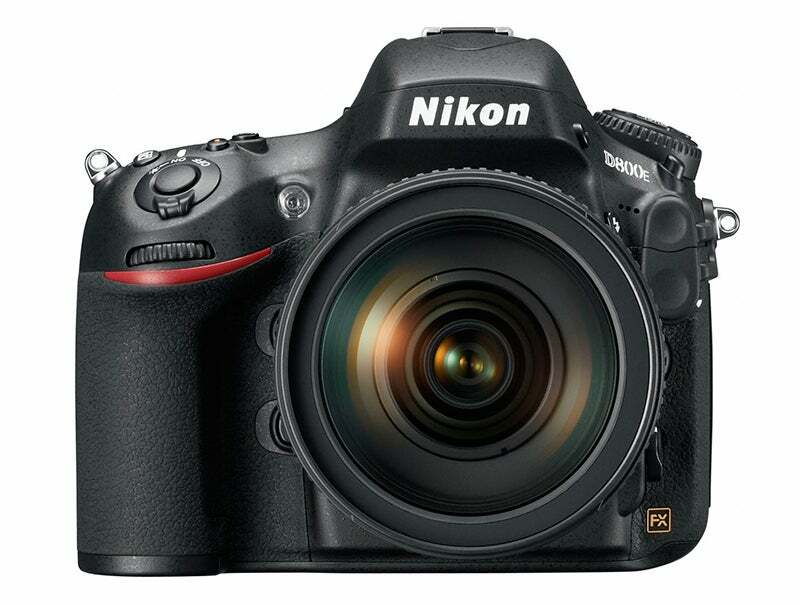 This opened up a gap for another manufacturer to exploit and take Nikon’s DSLRs head-on. 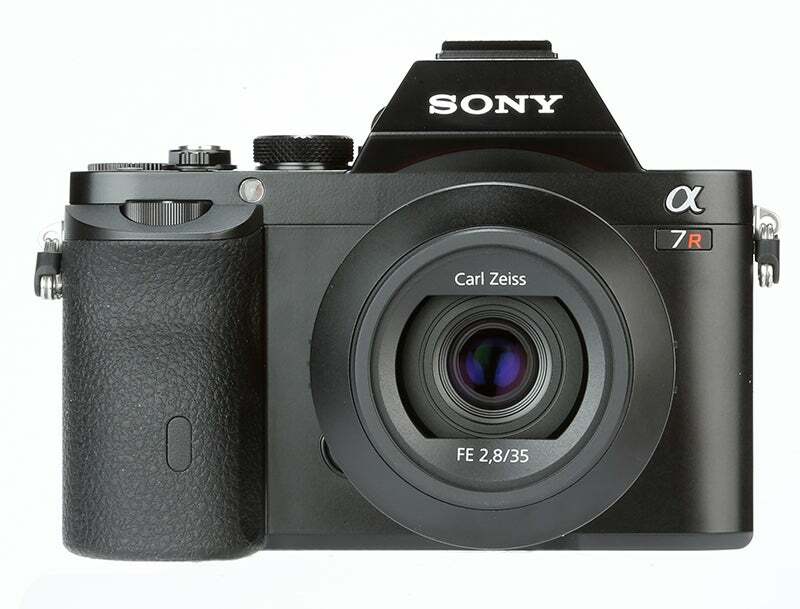 This manufacturer was Sony, who late last year released the A7R – the world’s smallest full frame system camera with an identical resolution to the D800/D800E. With a promise of delivering Nikon D800/D800E quality in a smaller and more lightweight system, has Sony succeeded in producing the best high-resolution system camera to date? Before we kick off, it’s important to clarify the reason for testing the Nikon D800E against the Sony A7R instead of the D800. The D800E is identical in every way to the D800 with exception to the optical low pass filter which is removed in an effort to increase resolution and sharpness in much of a similar way to the Sony A7R. To ensure our test was strictly comparative, we requested both models with the manufacturers best prime optics in the same focal length – the Nikon D800E with the NIKKOR AF-S 35mm f/1.4 G and the Sony A7R with the FE 35mm f/2.8 ZA Carl Zeiss Sonnar T* lens. The Sony A7R’s CMOS sensor features an identical 36.8MP total sensor resolution to the D800E, with a negligible difference in effective pixel resolution – the A7R produces a 36.4MP effective resolution in comparison to the D800E‘s 36.3MP. With both sharing identical sensor dimensions (35.9x24mm) it supports suspicions that both cameras use the same sensor made by Sony, however what’s interesting is that up until the A7R’s release Sony has never used this sensor before in its Alpha line, opting to use its 24.3MP chip instead presumably due to the fact it sold exclusive rights of the 36.3MP sensor to Nikon for a limited time period thats since expired. Unsurprisingly, both sensors produce a maximum image size of 7360×4912 pixels with the option to record at lower 20.3MP or 9MP resolution on the D800E or 15MP and 9MP on the A7R. Though both cameras essentially have the same ISO sensitivity output of 50-25,600, the D800E‘s native sensitivity range runs from ISO 100-6400 meaning you have to enter the L1.0 or H2.0 settings to access the equivalent of ISO 50 and ISO 25,600 respectively. The key difference regarding the sensor is the design of its positioning behind the lens mount. Whereas the D800E‘s chip is set back behind the mirror and shutter mechanism, the A7R’s sensor is much more exposed, sitting directly behind the smaller E-mount – one of the key contributions towards its compact size. Though the A7R is compatible with Sony’s E-mount NEX series lenses, these were originally designed for use with an APS-C sensor and as such won’t deliver the optical quality to match the 7R’s sensor performance. To get over this hurdle, Sony’s new FE-series of full-frame lenses should be used, but with a limited range of just four optics at present it starts on the back foot compared to the D800E‘s vast support of Nikon’s FX-format lenses. 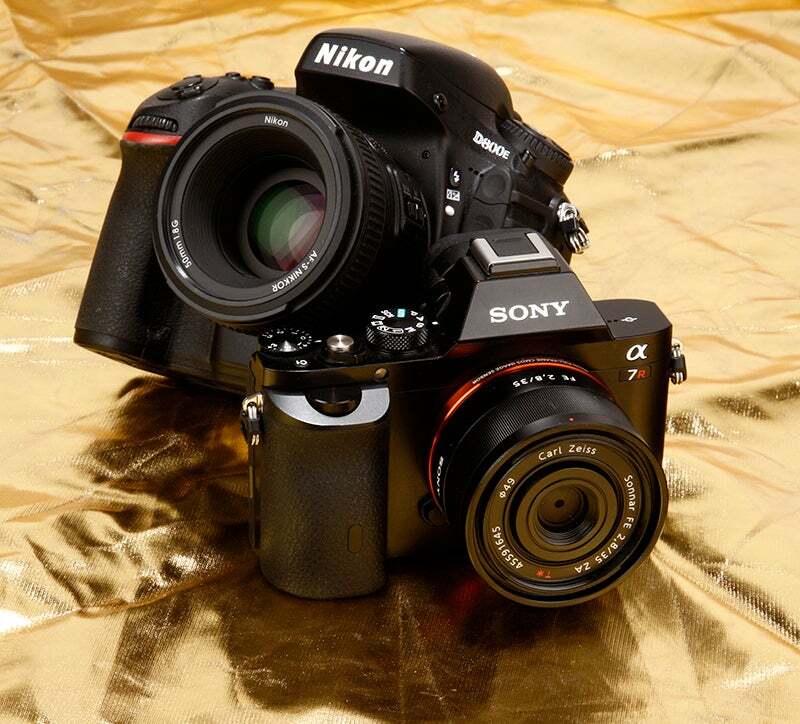 Sensor and lens compatibility aside, the D800E uses an EXPEED 3 image processing engine with 14-bit A/D conversion and 16-bit image processing whereas the A7R features Sony’s new BIONZ X processor with 14-bit Raw output. With regard to stabilisation, both support the use of optically image stabilised and non-stabilised lenses, with Nikon’s VRII system and Sony’s SteadyShot system claiming to allow users to shoot handheld up to 4-stops slower than would otherwise be possible. For autofocus, and as you’d expect of a DSLR, the D800E relies on Phase-detect AF whereas the A7R instead relies on a contrast-detection system that’s suspected to be less responsive in low-light. The Multi-CAM3500FX AF module provides the D800E with a 51 AF points compared to the A7R’s 25 contrast-detect points and with neither model featuring a touchscreen, AF points are positioned via the body controls. The rear screens and viewfinders differ too – the 7R features an electronic viewfinder due to its mirrorless design whereas the D800E‘s optical viewfinder with 100% frame coverage lies above a 3.2in, 921k dot display that’s larger than the 7R‘s 3in 921k-dot screen. Not only that, the D800E features a pop-up flash above the hotshoe that could be useful for fill-in, with the A7R lacking in this department with only a hot shoe to its name. The Nikon D800E is supported very well by a vast range of full-frame optics, however the same can’t be said at present for the Sony A7R. Although an adapter can be used to attach Sony’s A-mount lenses or other full-frame lenses, it adds unwanted bulk and goes against the principle of it being a small and light full frame camera. At present there are only four optics that match the quality of what the 7R’s sensor is able to deliver – the 35mm f/2.8 as used in this test, the 55mm f/1.8, 28-70mm f/3.5-5.6 OSS and the 24-70 f/4 OSS. There’s talk of a 70-200mm f/4 joining later in 2014 and up to 10 dedicated lens being available in total, but right now there’s no questioning it’s a restrictive system.